Fill and preheat the water oven to 182F/83.5C. 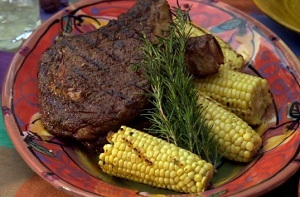 Season the corn with salt and pepper on all sides. Put the corn, butter, and cilantro into a large (gallon/3.8 liter) cooking pouch and vacuum seal. If grill marking is desired, preheat an oiled grill or grill pan to high heat. Before serving, sear the ears briefly on the hot grill for added smoky flavor, rotating to put a few grill marks all sides. In a large saucepan on the stovetop, put the water, carrot, onion, celery, bay leaves, thyme sprigs, and black peppercorn to make a poaching liquid and bring to a simmer for 15 minutes. Add the white wine vinegar and keep at a simmer. Bring the simmering pot of poaching liquid to a boil. Blanch the octopus for about 45 seconds and remove from the poaching liquid to an ice water bath to cool rapidly. Drain. Cool the poaching liquid. Put the octopus into two separate large cooking pouches, add a few tablespoons (30 to 45 ml) of the poaching liquid to the pouches and vacuum-seal. Submerge the pouches in the water oven and cook for 4 hours. Cool in an ice water bath until easy to handle. Open the pouches, discard the liquid. Remove the slimy membrane from the octopus tentacles. Put the octopus into a fresh cooking pouch with olive oil and vacuum seal. 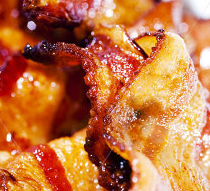 Grill to re-warm and impart caramelized color and taste before serving. In a small bowl, make the vinaigrette by whisking together the sherry vinegar, garlic, shallot, anchovy, mustard, smoked paprika and olive oil. In a sauté pan over medium heat, crisp the chorizo slices in a little of the olive oil. Drain on paper towel. In a separate bowl, toss the corona beans, parsley, olives, and chorizo slices with some of the vinaigrette. Check seasoning, adding salt and pepper to taste. Serve with the grilled octopus with more vinaigrette drizzle on top and a sprinkle of smoked paprika. Fill and preheat the SousVide Supreme to 180F/82C. Put the okra into a large cooking pouch, season with ¼ teaspoon of the salt and toss to coat. 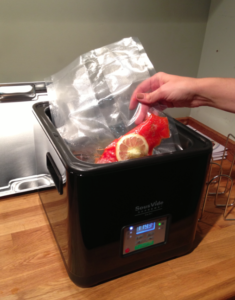 Vacuum seal the pouch and submerge in the water oven to cook for 15 minutes. Remove the pouch and quick chill it, submerge in an ice water bath, for 10 minutes to stop the cooking process. Meanwhile, prepare the lemon yogurt sauce by combining all sauce ingredients in a small bowl; whisk well to blend. Remove the okra from the pouch and pat dry with a tea towel or paper towel. Heat a cast iron skillet over medium-high heat. Add the olive oil and then the okra; cook for about 1 minute on each side or until browned (The okra can also be finished on the grill if you prefer). Serve immediately with the lemon yogurt sauce. Combine wine, sugar, orange peel, pepper flakes in a large saucepan. Bring to a boil, stirring to dissolve the sugar. Pour the mixture into a large (gallon/3.8 liter) zip-closure cooking pouch, add the rhubarb and salt and use the displacement method (Archimedes Principle) to remove the air and zip the seal. Submerge the pouch in the water oven to cook for 45 minutes to 1 hour, until tender. With a slotted spoon transfer the rhubarb to shallow dish arranging it in a single layer. Pour the cooking liquid into a saucepan on the stovetop and bring to a boil, cooking until it is thick, about 5 minutes. Pour the syrup over the rhubarb and cool, then cover and chill until cold. 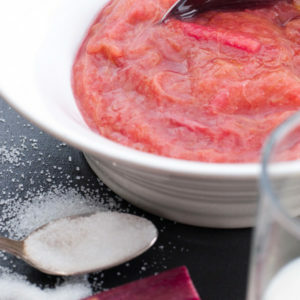 Spoon this rhubarb compote over duck, chicken breast, pork or beef. 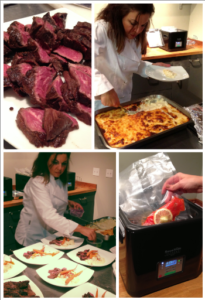 Learn more about this Seattle Sous Vide Cooking class here. In a blender or food processor, blend the sugar and egg yolks together until very thick and smooth. With the machine running, add the milk and continue to blend for a minute to thoroughly mix. Remove the pouch from the water bath and quick chill, submerged in ice water (half ice/half water) for 20 minutes, then refrigerate for 2 hours or until thoroughly chilled. When ready to churn, in a deep bowl, beat the cream until soft peaks form and fold the whipped cream into the custard mixture. Transfer the custard mixture to an ice cream maker and freeze according to maker’s instructions. 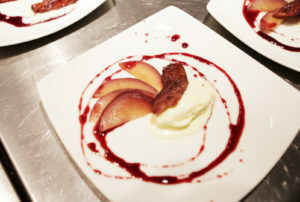 Serve with Vivian’s Red Wine Poached Pears and Candied Bacon for a real taste treat! Fill and preheat the SousVide Supreme to 125F/51.5C. Season the salmon with salt and pepper and the seasonings of your choice; put into a cooking pouch and vacuum seal. thickness of the fish, for a medium rare. When the cooking time has elapsed, remove the pouch, open it and pat the salmon dry. On the stovetop, heat the oil in a skillet over high heat and sear the salmon for about a minute, just long enough to give it a golden glow. Seasonings to consider: various salts (pink Himalayan, volcanic Black Sea salt, truffle salt), peppercorns (black, green, or pink), fresh herbs (basil, thyme, dill, chives, tarragon), citrus (lemon, lime, orange), or spices. Fill and preheat the SousVide Supreme to 176F/80C. Combine all ingredients except pears in a saucepan on medium high. Simmer for 15 minutes. Strain the reduction. 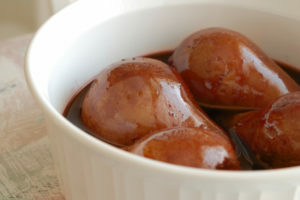 Put the pears into a zip-closure cooking pouch with red wine reduction. Use the displacement method (Archimedes’ Principle) to remove the air and zip the seal. Submerge the pouch in the water oven to cook for 30 minutes. Quick chill the pears in the pouch, submerged in ice water for 15 minutes after cooking. Refrigerate for an hour or up to overnight. When ready to serve, clip open the pouch and drain the cooking juices from the pears into a saucepan. Over medium heat, reduce the juices to the viscosity of a light syrup. Slice the pears and serve with the syrup. Fill and preheat SousVide Supreme to 185F/85C. Put all ingredients into a zip-closure cooking pouch and use the displacement method (Archimedes’ principle) to remove the air and zip the seal. Delicious straight out of the pouch! Season the potatoes lightly with salt and pepper and divide them between two large (gallon/3.8 l) cooking pouches, keeping them in an even layer. Add ½ stick (56 g) butter plus seasoning, in each pouch and vacuum seal. Submerge the pouches in the water oven to cook for 2 ½ hours. Before serving, preheat the traditional oven to 400F/200C. In a medium bowl mix all remaining ingredients together and set aside. When the cooking time has elapsed, remove potatoes from the water bath, drain pouch of accumulated liquid, and transfer the potatoes to a baking dish in an even layer. 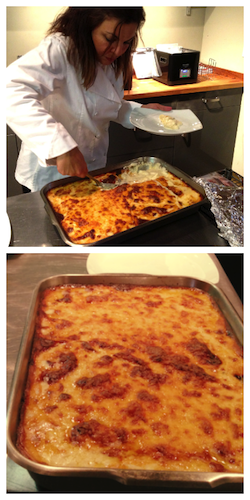 Pour the cream mixture over the potatoes and bake for 10 minutes or until top is crispy. 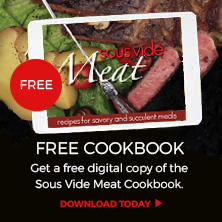 On May 29, SousVide Supreme joined forces with The Velvet Underground Dining Experience (VUDE) in Seattle to host a sous vide cooking class and dinner. Chef Vivian Peterson led guests in a dynamic, hands-on, 3-hour class on the sous vide technique, culminating in a five-course sous vide meal, complete with wine pairings from Hand of God Wines. The menu for the evening included sous vide Copper River salmon, potatoes au gratin, and poached pear in spiced red wine. View more photos from the event here.